Welcome to Guns 4 Roses - The Ultimate GNR Tribute Experience! 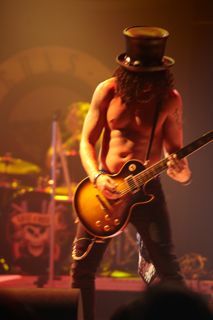 The total Guns N Roses rock and roll experience; long hair, leather pants, sunglasses, bandanas, top hats, and Les Pauls! Guns 4 Roses rock all your favorite Guns N' Roses songs from Welcome to the Jungle to November Rain and everything in between putting on a full stage production bringing you back to the classic Appetite for Destruction GNR lineup. More than just a Guns N' Roses tribute band, Guns 4 Roses has been selected as the World's Greatest Guns N' Roses Tribute Band by AXS TV! Guns 4 Roses's performance at the Roxy Theater in Hollywood on August 5th was broadcast live nationwide on AXSTV! The members of Guns 4 Roses have performed on stages all across the United States, Canada, Mexico, and Central America sharing stages with artists such as Vince Neil from Motley Crue and Bret Michaels from Poison while playing for crowds of Guns N Roses fans as large as 26,000. They've also had the pleasure of personally meeting many of the members of their famous muses, including Slash, Duff McKagan, and Steven Adler. Click on the music players below to hear Guns 4 Roses in action.